How to Talk Like Austin Powers. "Yeah, baby!" Who can forget Mike Myers's famous International Man of Mystery, Austin Powers? With his colorful outfits, crooked teeth and fake chest hair, Austin Powers became something of a cult figure in the late 1990s. Some of his expressions even became catch phrases, adorning everything from T-shirts to coffee mugs. If you want to be as cool as Austin Powers, you need to talk like him. Employ an exaggerated British accent. 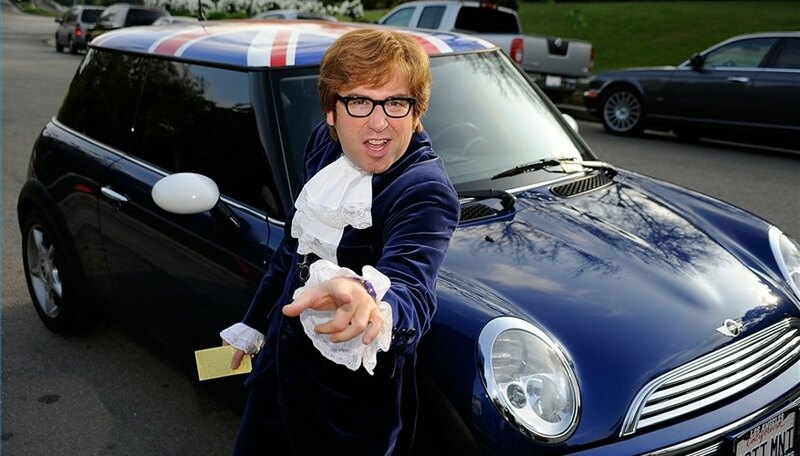 Austin Powers is a native of London, England, and Myers uses a comical British accent to portray the character. Use 1960s jargon. Inject words like "smashing," "groovy" and "shag" into your daily conversations. Make sexual inferences whenever possible. Austin Powers never misses an opportunity to allude to a woman's or his own body parts. Slip crude comments and silly jokes into most of your conversations. Even in serious situations, Austin Powers always has a pun or sexual overtone ready to lighten the mood. End a lot of sentences with an enthusiastic "yeah!" Use the word as an exclamation point when you say something witty or if you make a clever observation. Talk loudly. Be rowdy. Don't hold back. Austin Powers speaks his mind, no matter how crass or tasteless his comments might be. If you're going to talk like Austin Powers, don't be inhibited. Watch all three Austin Powers movies to get a feel for how the character talks: "Austin Powers: International Man of Mystery" (1999), "The Spy Who Shagged Me" (1999) and "Goldmember" (2002).